Animal agriculture is a textbook illustration of an atomistic economic setting. There are many small producers at the farm level in cattle, hogs, and sheep. The individual producer is a price taker and has no ability to command a price that ensures costs will be covered. In recent research, the average per-head profit for cattle feeding activities during the 1990s was estimated at — $4.27. Profits at the cow-calf level are variable, ranging in recent decades from $80 per cow in 1990 1991 to — $75 in 1996. Returns to producers will be variable as cycles run their course, even if demand is constant. Since the late 1970s, demand has not been constant. Demand for beef declined each year from 1980 through 1998, and demand for pork declined through 1995 (demand indices at www.aaec. vt.edu/rilp). Most researchers attribute the declines to a divergence between the fresh product offering and changing consumer preferences. Price signals to prompt changes in what producers offer have not worked. Important product attributes such as tenderness in beef have not been incorporated into the quality grades. The pricing system cannot motivate needed genetic and management changes at the producer level when important product attributes are not identified. The beef and pork sectors produced commodity product during the 1980s and into the 1990s and demand languished. Conversely, the poultry sector grew during the 1980s and 1990s as investments were attracted by profit opportunities. The reduction in per-capita consumption of beef from 94.5 lb in 1976 to 67.4 lb in 2002 was more than offset by chicken, where per-capita consumption increased from 46.9 lb in 1980 to 93.8 lb in 2002. Cattle and hog producers were forced out of business. The beef cow inventory declined from 45.7 million head in 1975 to 32.4 million head in 1990 and was 32.9 million on January 1, 2003. 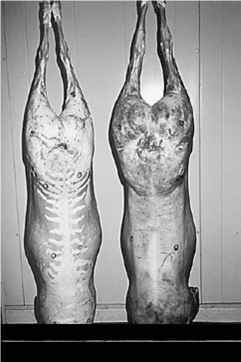 The breeding herd in hogs was 9.6 million head in 1978 and declined to 6.0 million head as of December 1, 2002. Significant increases in production per breeding animal in beef and pork were not enough to maintain market share. If the demand problems had continued, the beef and pork sectors would have been even smaller in 2003. Fortunately, the demand declines have been halted by moving to a new business model. Processors have made massive investments in product and market development since the mid-1990s. Following the demand lows in 1995 for pork and in 1998 for beef, the cumulative increases in demand have been 9.78% and 8.26% for beef and pork, respectively. Tables 1 and 2 show demand indices for beef and pork. The transformation of the supply chain away from commodity products and its related demand improvement have improved the economic outlook for every participant and especially the livestock producer. Producers suffer the most when processors see no reason to make investments in new product offerings. Check-off programs are too small to prompt change on the scale needed. It is the transformation from a commodity orientation to a consumer orientation that will be the primary determinant of the economic future of the animal industry.